Whether you live in the city, a suburb, or even a rural area, you are likely to find a number of dog walkers or pet sitters in your area. The trick is locating them, as they are often not listed in the yellow pages. Checking with friends who own pets and enjoy travel may net you some suggestions, but keep in mind that you want someone reliable. Ask about this as well, as friends can often give you input on their experiences and comfort level with each individual. Your second source for recommendations is local veterinarian offices. It is not unusual to find that a vet's office will have a tech that moonlights as a pet sitter or dog walker. The services they offer can vary from merely dropping by for a potty break and feeding, to a long walk or even an overnight stay. Their home or yours? Sometimes you'll have a choice. The overnight stay may be a particular perk if your dog is not comfortable with a crate or kennel at the vet's office or boarding facility. What could be better than a stay at his own home? In addition to this, having a vet tech or vet nurse care for your buddy at home could give you an extra sense of well-being if he has health conditions that you may worry about. Your Fido may be in good hands with this arrangement, without the confining conditions of a vet clinic kennel. There's another angle to explore here. If you are planning a longer trip--more than a short weekend--a little legwork may help you find a vet nurse who can care for your pup in her own home. This option worked well for me once while traveling with Oliver to another state. A plan to visit a local destination nearly was abandoned because we found no doggy daycares in this rural area. However, we did locate a vet nurse who was able to care for Oliver on her day off, and lucky Oliver had the enjoyment of playing with her puppy. The two were close in age and size--a perfectly fun day for both. One caveat to consider. A pet sitter can only do their job well when communication is thorough and not forgotten. You may find it most successful to write all instructions out and leave them with your contact information. I suggest using the Planet Dog Pet Sitter Instruction Pad, which will assure you leave nothing uncovered. Learn more at my Thursday post about this helpful product by scrolling down to it, or locating the link in my archives at the middle sidebar. The title is "Salvaging Your Pet Sitter Experience with Clear Instructions". Thanks for joining us for another edition of the Saturday Pet Blogger Hop. I hope you will enjoy bouncing around the blogs listed below, finding all sorts of fun ways to enjoy pets and their owners. The rules for participation by linking up are displayed below, as copied from Life with Dogs, one of the hosts. The hop is also co-hosted by Two Little Cavaliers and Confessions of the Plume. I have used a pet-sitter for years and we've devised a pretty thorough instruction sheet for them. And yes, a vet tech is perfect! We've found some of our better ones that way. I was a petsitter for several years, PetSitters International is an excellent resource for finding local petsitters. If you do an internet search for "your city Petsitters" you will usually get a pretty good list. Great post! As a pet sitter and former dog walker (I only board in my home now), I think your piece is good. 1. Professional pet sitters collect a lot of the details on how to care for your pet during their intake process - if they don't do this then you may want to look at finding another sitter. 2. A lot of states now have pet sitting associations and they can be a great way to find a professional sitter. Most have websites. I knows ours did and it made it easy to find a sitter using your zip code. PetSitUSA.com is also a great resource. It has tips on how to find a sitter, what questions to ask them, etc. 3. If you are hiring a sitter you should be checking to make sure they have insurance. This protects you, your pet, your house and the sitter. A lot of vet staff do pet sit and are really awesome people to ask, but many don't have insurance. If something were to happen to your home due to a mistake (left water on and damaged floor, etc.) you would want them to have insurance. I am SO going to check out that Planet Dog Pet Sitter Instruction Pad now. I always love new gadgets that make my life easier! Thanks! On the Pet sitters point, this is like any professional relationship you build, you need to develop a level of trust in their capability, they need to have references and they need to understand your needs and requirements. You cant leave any of this to chance. I've been a professional pet sitter for 10 years, and melf's comment has some great points to consider, especially about insurance. That picture in the article is so cute! 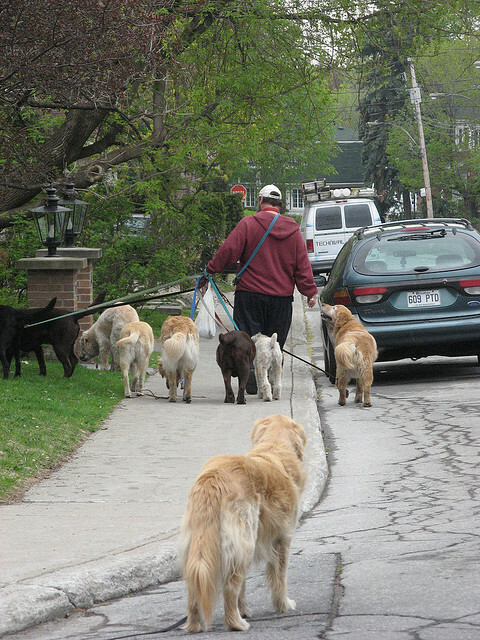 The dogs with the dog walker all look like they're happy, wagging their tails. The one not part of the group is looking like "Awwww, can't I come too?" Vet nurse Idea was good but you can't always be sure that you will get it in your area. Once we and my wife planned for a trip for a week our first choice was a vet nurse but unfortunately we failed to find in our area. At last we found a doggy day care service and we took our dogs there for one week.